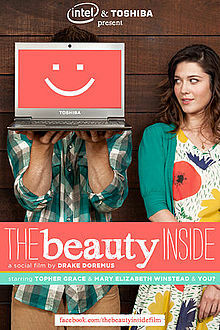 The Beauty Inside is an interactive social film, presented by Intel and Toshiba, directed by Drake Doremus, starring Mary Elizabeth Winstead, Topher Grace, and all of YOU. It's Hollywood's first film that gives the audience a chance to play the lead role. Nu mai aştepta să se schimbe lumea! Copyright (c) 2013 Inner Thought ~ Whisper .::ayek::. . Un produs Blogger.